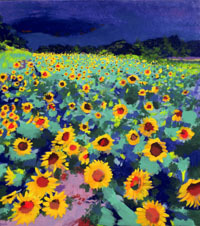 This is a reproduction of an original oil painting, Sunflower Field. One summer on the way to the beach, I took the scenic route and came upon a field of sunflowers. My car screeched to a halt; there was a small sign saying that this field was a memorial to someone who had died. I didn't have time to stop, so I had to make a special trip back to paint it. Some paintings are studies; and others, like this one, are vessels for feelings. Visually, the subject is wonderful - the forms, and especially the color - deep yellow, red, green and blue - very rich. Then there are the associations with sunflowers - Van Gogh for one. Leonard Cohen, the Canadian poet and songwriter, wrote a song called Suzanne, which Judy Collins recorded in the 1960's. Lines from the song: "...she shows you where to look amid the garbage and the flowers; there are heroes in the seaweed, there are children in the morning - they are leaning out for love and they will lean that way forever..." These sunflowers seem like a sea of faces; they vie endlessly for the sun's attention, turning every which way. This is an idealistic way to look at the world.